When Bryan Silverman was in high school, his older brother, Jordan, came to him with an idea. "He was reading in the bathroom on his phone and came out and said, 'Everyone reads in here. Let's make a toilet paper that you can read,'" Bryan remembers. "I pooh-poohed the idea," he quips. "I thought he was crazy." That was mid-2010. 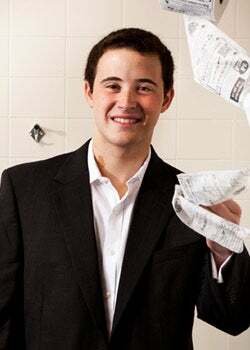 Jordan found research showing that Americans respond favorably to advertising in public restrooms, including signage above urinals, and came up with the idea to print coupons on toilet paper. The siblings went to work, building their startup, Star Toilet Paper, with less than $1,000 of their own cash. "Anything we could, we figured out ourselves and saved money," Bryan says. Star buys recycled toilet tissue rolls in bulk wholesale and has a printer place coupons on the top ply. "We use vegetable oil-based ink," Bryan notes for people concerned that it's unsafe to have ink "down there." "We tell people it is just like printed napkins. There's no danger at all." A series of eight coupons, including one for Star itself, repeats on each roll. Companies pay half a cent per ad, which includes design and tracking. Apartment complexes, theaters, stadiums and other venues receive the toilet paper for free in exchange for providing advertisers with access to their captive bathroom audiences. Initial advertisers included restaurants and pet stores; so far 65 companies have taken the plunge. The company is operating in Ann Arbor, where Jordan attended the University of Michigan, and Durham, N.C., where Bryan is currently studying neuroscience at Duke University. The Silverman brothers are reevaluating costs, looking for additional advertisers and expanding their reach outside their college towns. Plans for this year include finding a manufacturer to both produce and print the toilet paper, a move that could reduce their cost per roll by $1 or more. To finance expansion, the Silvermans are looking to raise funds from outside investors. The $5,000 prize money they receive for the College Entrepreneur of 2012 award will be used for retooling the Star website--crucial because its interface allows customers who see a coupon they like to enter information and download a PDF, so that they don't have to carry a square of toilet tissue into a store to redeem the offer. Additionally, by directing customers to the website (which also can be accessed via a QR code), the service provides advertisers with information on who is looking at and redeeming coupons. Bryan points out that he takes pleasure in entrepreneurship. "Some people are part of the choir," he shrugs. "This is what I am doing in my free time."